After an impressive year with the Ice One factory Husky team on a 450 back in 2015, young talent Nathan Watson was surprisingly not offered a seat for the following season in MXGP and ended up moving across to Enduro, enticed by a factory Red Bull KTM ride. 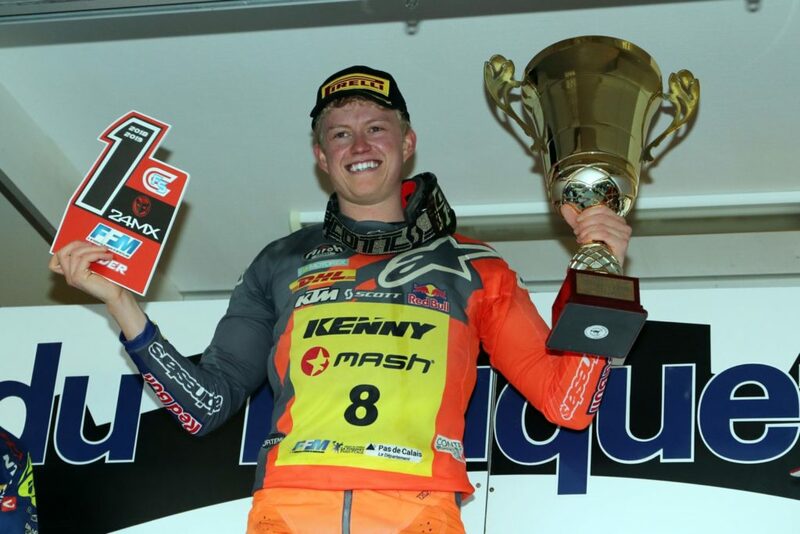 Since then Nathan has had numerous successes in his new career but the biggest individual win probably came at the weekend when he became the first British rider to win the prestigious Le Touquet beach race. Three hours of relentless sand whoops against some top level competition is certainly not an easy way to make a living, but Watson showed the skills and the heart to take a hugely important win in his career- and also cliched the six-round French beach race series to top off his brilliant weekend with a title! We caught up with the multi-talented Nathan, who will now get ready to compete in the WESS ( World Enduro Super Series) later in the spring, as the achievement of the championship and the Le Touquet win sunk in a couple of days later. I guess we will start with the win itself! 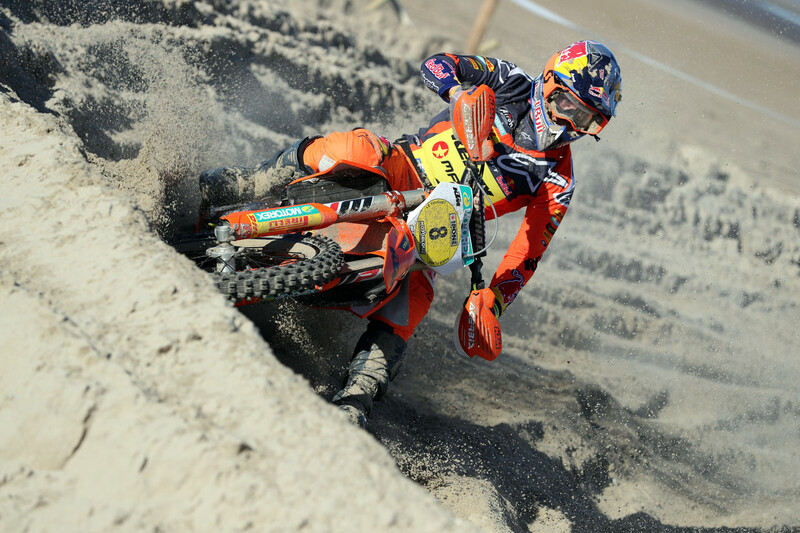 It’s probably the most prestigious beach race, how did you feel during the race, did you always feel the win was realistic? Yeah, leading up to the race there was a lot of pressure on me, a lot of people saying, ‘ you’re going to win this race, people are putting their money on you.’ So there was a lot of pressure really but I just tried to forget about that because I have had a good season and won quite a few of them this year, so I knew if I just do what I do I would be in with a shout if everything went good. But at the start of the race I was a little bit worried. The first two laps I was struggling with the speed of the race, it was just crazy, everybody was going so fast and kit taking risks and that’s not really my style, so I was losing quite a bit of ground the first two laps. Then obviously I got going as it got rougher and slower. I knew if I was in sight within the first hour and a half and within the minute, I could do it when it got rough towards the end and I could keep pushing on. Obviously you’ve to pace yourself but is it easy to know what position you are in, in the middle of the battle, is it easy to see your pit crew and strategise throughout the race? Yeah you have a rough idea but you only see the pit-board once throughout the lap and the lap is obviously so long, sometimes someone can pass you and you don’t even see them because there are that many people around you or you can pass someone without realising! But you know more or less, at the start it was impossible to know where you where because there are just so many people. When they finally told I had won it really hit me! On the last lap you were working your way through backmarkers, your foot came off the peg over one of the big sand whoops, was your heart in your mouth trying to predict where the backmarkers are going and try to still hit the right ruts and all? Because of the situation I was in and didn’t know where I was, I just took it as another lap, it was probably less stressful than knowing I was in the lead and just trying to nurse it home. At the Knockout when I was in the lead it was horrible because I was thinking, ‘ what if I run out of fuel or crash,’ but here I was going to full chat just because I didn’t know so it was nice in a way, to be fair. I saw a lot of the guys dealing with the backmarkers choosing the opposite line but sometimes the backmarker gets sideways and then ends up in that line too. So are you trying to predict what way they will go or are you just focusing on your line and hoping then don’t end up there? Yeah you have to be really smart with the backmarkers, you have to try and look ahead and read what they are going to do. I think it comes with experience, obviously I have done plenty of these beach races so I think I am quite decent at doing that naturally, but there is definitely some luck involved as well. You have to hit some of the singles blind and somebody might have crashed on the other side and you are literally skimming them! So it’s just pure luck if you hit them you know? But if you can see them then you need to use your head and dodge them. Those races, how long does it take to physically recover from them, they are pretty brutal, it’s sand whoops for two or three hours! It definitely takes its toll on the body. Before the race I just tried to chill out and save all my energy, eat plenty to get plenty of fuel on board. Yeah, like you say, it’s three hours of basically whoops because it’s so soft and gets so rough right away with all the riders on a 9 mile track. Now I haven’t got anything until the WESS in May so I am actually going to take a bit of time off the bike because I have been flat out. I did beach races last year then the WESS then straight into the beach race again. So I have a bit of time and I think it will be good to get some time off the bike now and fully recover, definitely this week I won’t be doing much physical stuff because I will be hanging! You were also the first Brit to win the race, so that must make you really proud of what you were able to accomplish? It’s a massive achievement really now it has sunk in, at the time I wasn’t really bothered about that, I just wanted to win the race. I knew before because people were telling me, ‘Nathan, no Brit has ever won this race, you could be the first one,’ so it was definitely some extra motivation! It was a bonus that came with it. You were a GP level motocross rider, and switched to Enduro and doing beach races as well, how have you found the whole switch, was it easy or do you wish you were still doing some motocross? Yeah, some of the hard days when I am in the mountains doing extreme and struggling like hell , I really do miss the motocross. I have done motocross all my life so it’s in my blood and I do miss it on days but I think for my career and everything I have definitely made the right choice. I think if I was still doing motocross I wouldn’t be doing the stuff I am right now like beach races that really do suit me, I don’t have any regrets and I enjoy what I am doing now. Have you any plans to do any motocross races this year? I’d love to but my team don’t really want me to take the risk of doing something. But I am definitely going to try and fit some motocross racing in just for some fun and keep my foot in the door with the motocross stuff because I haven’t done any in a while and I have missed it. Your brother Ben has just had the best year of his career finishing fourth in MX2, you’re probably at the peak of your powers at the minute too, so it must be really cool to have you both succeeding at a high level at the same time. Yeah, it was amazing following Ben last year with his success and everything. When you are kind of a part of that, it does motivate you, it motivated me to work harder seeing what he does and how hard he works and I think we bounce off each other like that. It’s really cool we are both having success in different disciplines. He’s away living in Europe now doing his thing, but do you ever get riding much motocross with him during the year or is it getting harder to do that? Yeah since he moved to Belgium it’s been fairly difficult because I don’t really see him but in the winter I will go and stay at his apartment in Belgium because that’s the hub for motocross, that’s the place to be and he needs to be there and for anyone racing MXGP, that’s he place to be. He has his own programs and plans and everything like that so I kind of stay out of the way and let him crack on, a couple of times a year we maybe get riding together now but not like it was when we were both living here riding together every time, it’s a bit different now. I’ve seen some media suggest you would be a good pick for the Nations at Assen this year. I don’t know how likely that is for the team manager, but is it something you have thought about having two Watsons on the GB team at the Nations at Assen?! Yeah I have seen a few things pop up on Instagram and a few mentions, it’s quite nice to see people say that and yeah, it would be an absolute dream if that was to ever happen one day. It’s probably not very likely a team is going to pick an Enduro rider for the MXON, it might get some bad publicity but I’ve proven I can ride sand with the beach races and all that so if they called me up I would be saying yes straight away! You have always been a good sand rider even in your motocross days, obviously beach racing is next level but do you enjoy just going through those whoops, the momentum you can carry is pretty impressive! Yeah it’s always been my specialty and I don’t know why! We haven’t got that many sand tracks in England compared to Belgium and I have always lived at home, it’s just something I have always enjoyed and I think my long legs and physical features help me a bit with my sand riding. I guess I just enjoy and it just comes natural to me and when you enjoy are having fun riding you always go faster. Will adjust your training then for the Enduro races compared to what you have been doing for the beach races? Yeah I’ll probably not touch the beach race bike now until September when it’s coming back into that season. We don’t even have a beach race on the WESS calendar so it will be proper Enduro stuff, I need to really work on my weaknesses in that, so it will be more trials, and extreme stuff, going over rocks, uphills, the complete opposite really to what I have been doing this winter! I guess it’s good for your mind too, getting to do something different and not just the same routine every week? It definitely keeps the fun it having all these different disciplines, it’s hard to train perfectly for all the races because there are so many different things you need to do but it keeps it fun and exciting.